Please click on the headline links to expand the stories. Book now! Asiana Airlines has great deals on air fare going on now. Please call us at 253-226-2742 to reserve your spot. Click here or the image for more information. Not painting or drawing on the paper, she only uses Hanji with different colors as a medium to glue on the canvas. Join us for this fun filled family event featuring Indonesia. Click on the headline link or image below for more information. Thank you Indonesian Cultural Association for donation the proceeds to our building funds. NEWS ALERT! Due to the weather we have postponed the New Year Celebration to February 23rd. Our year long Cooking Series is starting with New Zealand. Learn took cook a delicous Meat Pie with Marmite Toast. Served with Pavlova with fruit and the famous hot Milo drink. Presented by Maringi Lloyd and our New Zealand Team. Get you your tickets now - please call us at 253-383-3900 or purchase online - Click Here. See his images at the APCC Gallery starting January 1, 2019. More information on Jason - click here. OCTOBER 27TH at APCC: Filipino American History Month Free Family Event. Join us for a fun filled event celebration Filipino American History Month. October 27th at APCC. 10 am to 4 pm. Click here or the image below for more information. Taste of Asia October 6th. Featuring Japan. Learn to cook Tonkatsu Deep Fried Breaded Pork Cutlet. Dessert is Dorayaki (Red Bean Pancake), Miso Soup and Sencha Green Tea. Presented by Mari Wilson. Reserve you spot now by calling us at 253-383-3900 or CLICK HERE or image below to reserve online at. FREE Performance by Kkocdooseh at Rialto Theater. September 21st. Call us at 253-383-3900 or CLICK HERE to reserve your seat. Join us on September 21st at the Rialto Theater in Tacoma for a FREE performance by Kkocdooseh. Be thrilled with the non-stop, high energy and beautiful performance of this world renown group. This event is a must see by the whole family. They are fun, highly athletic and the energy is amazing. Get your FREE tickets now! Sponsored by: Korean Consul General's Office in Seattle, The Korean Foundation, and Asia Pacific Cultural Center. APCC has partnered with the Broadway Center to present the amazing Chinese Warriors of Peking. Thursday, September 20, 2018 at 7:30 p.m.
Rialto Theater - CLICK HERE for more information and tickets. Our 21st Annual Polynesian Luau is almost here! Call us at 253-383-3900 or CLICK HERE to purchase your tickets online to reserve your spot. We have tables of 10 available. Purchase your tickets now. Don't miss out on this years event, which has sold out the last few years. Great entertainment, food and booths. Fun for the whole family. 2nd Annual Korean ChuSeok Festival. FREE EVENT! Please click here on the image below for more information and to purchase tickets online. Thousand Faces Chinese Opera - Success!!! Continuing in our efforts in bringing high quality cultural events. We are proud of the Thousand Faces Chinese Opera on May 12th Seattle and 13th Tacoma. It was a big success! CLICK HERE or the image below to see images of this amazing, exciting and beautiful event. Please click on the image below for more information. We are excited to present this event to the public. We are very excited to present this upcoming show in Seattle and Tacoma. Join us for an amazing evening of entertainment. Please click here for more information and ticket purchasing. See her work at the APCC gallery starting in April and please join us for her artist reception on April 6th, 4-6 pm.Light refreshments will be served. The main themes in D33Light’s art focus on the spiritual aspects of the mind and the ways in which people can reach liberation, or moksha in Sanskrit. March Artist Esther M Smith (°1954, Wiesbaden, Germany) creates mixed media artworks and drawings. See her amazing work at the APCC gallery starting March 3rd. Click here for more information. 2018 Samoan Cultural Celebration Committee Application for Scholarships. APPLICATIONS ARE NOW BEING ACCEPTED FOR SCHOLARSHIPS. Click here to download the application form. Ten (10) $1,000 scholarships will be awarded to this year’s high school seniors who are of Samoan or part-Samoan heritage and plan to enroll in college/university for Fall 2018 Semester. The scholarships are sponsored by the Samoan Cultural Celebration Committee, a group affiliated with the Asia Pacific Culture Center (APCC). Seniors attending high schools in the State of Washington are encouraged to apply. Questions - please contact Mattye Evans at mberryevans@mercyhousing.org, cell: 253-208-8769. Susan Kim, Artist Show at APCC. 2018 Taste of Asia cooking series tickets now available ..
Saturday, November 4th. Presented by Nerice Donna Rose Orvis - Taste of Asia, our continuing cooking series, featuring the Philippines. Join us at this fun event, meet new friends and eat! Call us at 253-383-3900 to reserve your spot or CLICK HERE to register online. Larine Chung Solo drawing Solo drawing exhibition showing at the APCC gallery Nov. - Dec.
See Steve's beautiful and amazing work showing at APCC from September through October. Click here for more information. We are currently accepting applications for retail, food and non-profit booths. Please click here for more information. John Davis Jr. Photographer. View of China Through a Western Lens Exhibit is now showing at APCC. Join us for an Artist reception on August 17th, 4:00 to 6:00 pm. Light refreshments will be served. Noel “Bote” Bautista. Our featured artist, now showing at the APCC Gallery. Join us for his artist reception, May 18th, Noon to 2 p.m. Click here or the image for more information. Join us for this once in a lifetime tour of Thailand. Click here for more information. By popular demand, we invite back our instructors, Lisa Long and Lely Shim from University Puget Sound. Click here to register. *All supplies are provided with snacks and drink. Join us at APCC for this two day instructional class. Create beautiful patterns on textiles with this traditional method. Saturday (March 25th) and Sunday (March 26th) from 1 - 4 pm. Click Here to register online or call us at 253-396-0813 to reserve your spot. Instructor Lely Shim is from Jakarta, Indonesia. She has been in WA since 2005. She is instructor of basic Indonesian Language in LIASA program with UPS and JBLM. She is active member of Indonesian Cultural Association. Instructor Lisa Long is a study abroad administrator at the University of Puget Sound who strives to promote cross-cultural interaction and life-long learning. Presented by Linda Wang. . Call us at 253-383-3900 or click here to reserve your spot online. 19th Annual New Year Celebration. New Year Celebration Vendor Booths are SOLD OUT for this year - please call the office for more information at 253-383-3900. Thank you for your interest and we hope to see you at the celebration. 20th Annual Polynesian Luau August 12th. Join us this Saturday, Jan. 7th for the first Taste of Asia with Tea. Starts 11 a.m. Learn to cook Thai Stir Fry Chicken Ginger served with rice. Bael fruit tea will accompany the lesson. Presented by Arisa Williams. Call us at 253-383-3900 or click here to reserve your spot online. See beautiful art at APCC by our featured artist Soojeong (Crystal) Shin. We are also offering classes in Oil painting every Monday and Watercolor and Chinese Gongbi painting classes every Wednesday. Washington Overseas Chinese Artists Association Art Show. September 9th - October 28th. See beautiful images using old style letterpress printing now at the APCC Gallery. This process is an art in itself. Join us August 18th to meet the artist. Join us for a reception to meet and greet the three artists on March 5th from 2 pm to 4 pm at APCC. Join us March 5th at Noon for another delicious Taste of Asia featuring Korea and presented by Ms. Jung Hee Park. Call 253.383.3900 or CLICK HERE to purchase your tickets online to reserve your spot. Learn how to make Put Kum Mi (붓 금 미). This Traditional snack was served after the monk became official by cutting their hairs. But most people eat this because they believe that this dish will enhances their memory, and keep them fulfills their stomach. The main ingredient is made from the sweet-rice, and they put either cooked black beans, or red beans as a filling. Join us March 5th at 10 am for another wonderful Tea Ceremony featuring Korean and presented by Ms. Jung Hee Park. She will talk about Wild sesame tea ― customarily enjoyed as a no-frills beverage of ground wild sesame seeds and hot water ― has been revamped into a decadent yet wholesome beverage. Join us February 6th at 10 am for another wonderful Tea Ceremony featuring Taiwan and presented by Linda Wang-Stewart. She will talk about flavor teas including flower teas, fruit teas, herbal yeas and milk tea. These are new tea trends in Taiwan. Join us February 6th at Noon for another delicious Taste of Asia featuring Taiwan and presented by Linda Wang-Stewart. Join us for the first Tea Experience ceremony "Sekoteng" from Indonesia. Maria Spear will be the presenter. New this year, you can purchase tickets online. Please click here to purchase tickets and reserve your spot. Join us for our first Taste of Asia on January 9th. Learn to cook "Soto Ayam" (Indonesian Chicken soup) from chef Maria Spear. New this year, you can purchase your tickets online. Click here to purchase tickets and reserve your spot. Watercolor and Sumi Paintings by Alice Liou. January 3rd - February 26th. Showing daily 9 am - 5 pm. Join us for the artist reception January 21st. 4 pm to 6 pm. Light refreshemnts, Chinese Calligraphy Demonstration, free gifts and hands-on activities. Celebrate the vibrant cultures of the Far East on Asia Pacific Cultural Center Day, taking place Saturday, September 12 on Showplace Stage. Groups from around the South Puget Sound will pay homage to their heritage through traditional dress, dance and music. Shows are free with Fair admission. Join Tacoma Public Schools at APCC for this free event designed to help you with resume writing, interviewing and finding a job. In addition ... (see more). Purchase your tickets for the 18th Annual Polynesian Luau now! This family-friendly event will be held on August 8, 2015 at 1:00pm on the beautiful grounds next to APCC. There will be live music, dances from the Pacific Islands, and an exotic island menu for all to enjoy. Call APCC at (253) 383-3900 or email faalua@comcast.net to purchase tickets. The 5th Annual Samoa Cultural Day Event will begin its 3 day event with their Community Dinner on the evening of July 9, 2015 at the Emerald Queen Conference Room in Fife, WA. Please get your tickets now by calling APCC at (253)383-3900. On Friday, July 10th is the 4th Annual NHPI-MOVE IT! Event at Mt. Tahoma High School Athletic Stadium with the fun activities beginning at 8:00 AM. This is a free event and the entire family is invited. Bring the kids! It's for them. Saturday, July 11th is the main event --- the 5th Annual Samoa Cultural Day at Mt. Tahoma High School Athletic Stadium with festivities beginning in the morning at 8:30 AM and running all day until 5:00 PM. Thousands of people will be in attendance so come early and bring the family. It's a free event. Food booths, arts and crafts shops, dancing groups, local leaders, visiting dignitaries, cultural displays and demonstrations, truly an exciting day is planned for all. Come ready to enjoy the food, the sights and sounds of the beautiful Samoan islands, the culture and people. APCC 3rd Annual Summer Camp is ready to begin. Register your children now for this unique, educational, activity oriented, and fun time. The camp opens on July 6th and will run until August 14th. Fifteen different Asia Pacific countries and islands will be featured and children will get a hands on, participatory experience with each of the 15 various cultures presented during the three week camp. The teachers and presenters are looking forward to working with the children and are anticipating a large enrollment and making this the best APCC Summer Camp ever! Click here for more info. Ms. Maggie Ho invites you to a reception at the Asia Pacific Cultural Center to meet the artist on May 23rd from 2:00 - 4:00 PM. Guests will also view the exhibit and take part in a free brush paint demonstration. There will also be a chance for all guests to win a free 2 hour art lesson provided by Ms. Maggie Ho. Refreshments will be served. Local area Samoan high school students living in the Greater Puget Sound Region and who want to pursue post high school education now have an additional resource to apply for monetary assistance. The 2015 Samoa Cultural Day Planning Committee are offering for the first time an annual academic scholarship program for local area Samoan high school seniors. The $500 scholarships will be awarded to those high school students who complete the application and meet the basic requirements and criteria. The application process is very simple with a few basic contact information questions; school background information; post secondary plans; and, 3 essay questions that will help students to explore and discover who they are and how their life experiences have shaped and prepared them for this next step of their journey. Ten (10) - $500 scholarships will be awarded to this year’s high school seniors who plan to enroll in college/university or trade school this fall. Please click here to download a pdf copy of the application and submit by the deadline dates indicated. MARK YOUR CALENDARS: June 22 - 25th - Traditional Korean Herbal Cooking Workshop at APCC - June 26th is the banquet! From June 22 to June 25th APCC will host for the first time a "Traditional Korean Herbal Cooking Workshop." A cooking class/workshop will be offered each day from 10:00 AM to 3:00 PM. Participants who register must commit to attending all four classes. To register for the workshop please call Patsy S. O'Connell at (253)226-2742 or email her at psurhoc@comcast.net.Call early, space is limited. More information and details are forthcoming. SAVE THE DATE: The White House Initiative on Asian Americans and Pacific Islanders Region 10 Interagency Working Group invites you to an Asian American & Pacific Islander Community Roundtable on Thursday, June 25, 2015 at the Asia Pacific Cultural Center, 4851 South Tacoma Way, Tacoma, WA 98409. Learn about critical federal programs; discuss key issues facing the AAPI community in the Tacoma/Puget Sound region; and engage in a dialogue with your local federal government. Korea is known for its delicious Kimchi! Did you ever wonder how to make this flavorful dish? Come and learn all about it from Kimchi Master Joyce Yoo at the Korean Kimchi Workshop. At the end of each class you will make your own jar of Kimchi to take home! Sign up early! Space is limited! Mark your calendar for the March 7th, APCC Taste of Asia Cooking Class featuring Kimbap or Gimbap, a popular Korean dish made from steamed white rice (bap) and various other ingredients, rolled in gim (sheets of dried laver seaweed) and served in bite-size slices. Gimbap is often eaten during picnics or outdoor events, or as a light lunch, served with danmuji or kimchi. Asia Pacific Cultural Center Gallery has a new show now on display for March/April feature artist is Ms. Sunyoung Kwon. 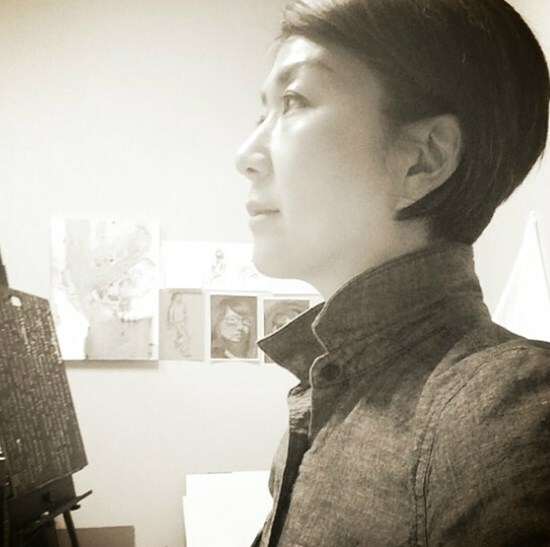 Ms. Kwon studied in France, received her BFA from Hong-Ik University in Korea, then MFA in Printmaking, minor in Sculpture at Rochester Institute of Technology in NY. She had exhibitions throughout Asia and USA. She is an owner of Studio S, Fine Arts teaching ages 12 to adult art classes in Lakewood, Federal Way and Bellevue. Meet the artist reception is set for Saturday, March 21, 6:00-8:00 PM. She will also share her work process through short video. You can watch today's Tacoma City Line Telecast by clicking on this link www.cityoftacoma.org. APCC Executive Director, Lua Pritchard, New Year Celebration Steering Committee Chair, Dr. Belinda Louie and representing admirably the host nation, Pakistan was Ms. Saima Shahid. The APCC portion of today's telecast comes at the end so if you want to by pass the other featured guests jump to the APCC segment beginning at about the 46:30 minute point. APCC will host its second Tea Experience class of 2015 on Saturday, February 7th at 10 AM. Serving as hosts and tea master will be Terry and Cezar Bordon. They will share a Filipino favorite, "Salabat Tea". Tales from the old country, as well as local northwest Filipino community experiences and if lucky, some quaint, Filipino treats will all be part of the Tea Experience. The next Taste of Asia class will be on Saturday, February 7th at 12:00 Noon at APCC, 4851 South Tacoma Way, Tacoma, WA 98409. The featured Asian Pacific country for the month of February is the Republic of the Philippines. Come, join us to share in a unique cultural experience. The Filipino chef for the day will prepare a favorite, traditional dish and share his insight and experiences about the food and the stories. A fun, relaxing and friendly time for all. Patsy Surh O'Connell founder and president of Asia Pacific Cultural Center has been teaching an art classes in the Pierce County area for the past 28 years. Her students who attend her current class at APCC are now displaying their art work at the APCC Art Gallery which will run until February 27th. APCC's popular Tea Experience and Taste of Asia/Pacific 2015 Schedule is now available and begins this Saturday, January 10th. The Tea Experience kicks off the new year featuring teas from Indonesia with the program opening at 10 AM. Following the Tea Experience will be The Taste of Asia/Pacific which begins at 12:00 Noon featuring the island territory of Guam. Please join us. Tea Exhibit costs are $5 for APCC members and $10 for non-members. Taste of Asia costs are $20 / members, and $25 / non-members. Now on display at the APCC gallery is the art work of local artist Julian Pena. The APCC gallery is open to the public 7 days a week and visitors are welcome during normal working hours 8:30 AM to 5:00 PM. A reception at APCC for Julian is being planned for December 18th. An announcement and invitation will be forthcoming giving details on date and time. APCC is offering a Paper Folding Workshop on Wednesday afternoon, Nov. 19, 2014, 1:30 to 3:00 PM. Instructor is Patsy Surh O'Connell, founder and President of Asia Pacific Cultural Center. Cost is $15 with an additional $5 for materials. The class will be held at APCC. Please Call (253)226-2742 to see if there are still slots available and pre-register. Asia Pacific Cultural Center will again hold it's 2015 Asia Pacific New Year Celebration at the Tacoma Dome Exhibition Hall on February 14, 2015 with doors opening at 10:30 AM. It promises to be the biggest and best New Year Celebration ever. The 17th Annual Asia Pacific New Year Celebration for 2015 will feature for the first time the country of Pakistan who will serve as the event's host nation and will highlight their country's culture, history, art and traditions. The Pakistani themed event will begin with the opening ceremony featuring their dances, culture and musical traditions. The thousands of guests and visitors who visit on that day will again be treated to the aroma and taste of the many food booths serving Asia Pacific food delicacies. They will also be treated to the exotic and exciting music, culture and dance of various Asia and Pacific Island countries. The final APCC Taste of Asia Pacific will be on December 6, 2014 at 12:00 noon. Featured is the cuisine of the island kingdom of Tonga. Come join us and learn how to prepare and cook the featured island recipe. The final activity for the day brings together all participants to share and taste the food prepared by the guest chef from Tonga. The last Tea Experience of the year 2014 is on Saturday, December 6th at APCC - 10:00 AM. COST: members $5.00 | non-members $10.00. APCC Raising Money for New Cultural Promotion Project / See how every dollar you give will be matched by an anonymous donor. APCC is raising money through power2give/PugetSound presented by ArtsFund, an online cultural marketplace connecting donors with projects they are passionate about. The money raised will go towards the purchase of a Television, DVD player and speakers to be placed in the APCC Lobby area. Visitors as they enter the center,will be able to watch and listen to the various cultural programs and activities hosted by APCC throughout the year. All donations large and small are accepted. There is also an anonymous donor who is generously matching dollar-for-dollar any amount you give for this project. Your dollars will go twice as far through the support of ArtsFund. Local Puget Sound Sumi Artists have some of their favorite art work on display at the Asia Pacific Cultural Center Art Gallery. The public is invited to the certer to view the beautiful art work at the gallery. Free admission. Calling all middle and high school students and their parents to come out Wednesday evening, 29 October 5:30 to 7:30 PM for the Asian Pacific Islander College Resource Night at the Asia Pacific Cultural Center. Admissions staff from the local colleges and universities will be on hand to help walk students and their parents through the admissions process. Come get your questions answered and learn what you need to be ready to take that next step towards college. Three workshop sessions will run from 5:30 to 6:30 PM. A College Resource Fair will run from 6:30 to 7:30 PM. Refreshments will be served. 4th Annual NHPI MOVE IT Program - Friday, July 4th, 8:00 am - 1:30 pm. Bring your kids, the whole family to start off your 4th of July with a fun packed morning of action activities, workshops, games, competition, singing, dance, exercise and fellowship. All FREE at no cost - including a healthy lunch bag for all participants. What has become Washington State's largest and very popular cultural event is coming to Tacoma on July 5th. The Celebration begins at 8:30 am at the Mt. Tahoma High School Athletic Stadium. Thousands will be coming from the area's Samoan community as well as the general public to witness and participate in this fun-filled FREE Event. There will be inspirational speeches, funny stories, non-stop entertainment and food booths with delicious island style food and beverages available for purchase. There will also be island clothes and ware available at the many retail booths that will be doing business on that day. Presenting a Korean Traditional Hanji Paper Fashion Show July 30, 2014 at Seattle Asian Art Museum and August 2, 2014 at Tacoma Museum of Art, both shows start at 7:00 PM. APCC will once again host its 17th Annual Outdoor Luau at APCC. August 9th at 12:00 Noon. Tickets are $50 per person; $20 for children 4 - 11 years old; children under 3 are free. Live Music, Polynesian floorshow, Polynesian Feast, Arts and crafts, and lots of happy, friendly people await you on that day. Don't miss it. Get your tickets now. Call (253)383-3900 and reserve your table. Asia Pacific Cultural Center presents Korean Traditional Hanji Paper Fashion Show July 30, 2014 at Seattle Asian Art Museum and August 2, 2014 at Tacoma Museum of Art, both shows start at 7:00 PM. Hanji is an ancient Korean tradition of paper making and this summer's fashion show will feature the use of this quality paper as primary material for the women's fashion which will be displayed at both shows. Directing the show will be renowned Korean Hanji Designer Professor Jeon Yang-Bae from Gunsan, Korea. Asia Pacific Cultural Center will again host their Asia Pacific Cultural Summer Camp for ages 7-12 at the center located at 4851 South Tacoma Way, Tacoma WA 98409. The cultural summer camp will run from June 23 - July 13, 2014. It is a day camp that runs from 8:00 AM to 3:30 PM, Monday through Friday. Please see program flyer for additional details and the APCC website address for registration information or call the APCC office at 253-383-3900 and ask for information about the Asia Pacific Cultural Summer Camp 2014. Kimchi Workshop this Friday, May 9th at 6:00 PM at APCC. Register Now! Thailand movie, Somtum (Muay Thai Giant) will be the featured film at this month's APCC Free Movie Night on Thursday, March 20, 2014 at 7:00 PM in the APCC Auditorium. It promises to be an action packed film with lots of humor and Muay Thai action. Thank you to a very dear and valued APCC volunteer Mr. Gilbert R. Tagaban for his wonderful photographs taken during the February 15th Asia Pacific New Year Celebration held at the Tacoma Dome Exhibition Hall. He did a great job capturing the people, ceremony and performing groups that entertained the crowds all day. Go to the APCC website: www.asiapacificculturalcenter.org and clck on the photo tab at top of home page. It was truly an event the entire Asia - Pacific Islander community in Washington State can be proud of. It is estimated that nearly 10,000 people attended the festivities on that day. It you were a voluteer on that day or a performer...thank you for making it a very special event. And, thank you again Gilbert for taking the time to capture the event on camera. You made a lot of people very happy. Please join us at APCC on Saturday, March 15th at 7:00 PM for a unique Hawaiian experience as Grammy award winning artist Keoki Kahumoku, Grammy nominee Chino Montero and ukulele extraordinaire Herb Ohta Jr., come together for an evening of exquisite home grown Hawaiian music plus hula performances and ono-licious Hawaii food. Tickets are $20 payable at the door or on line at www.honeebeeproductions.com. APCC is offering 6 new Kimchi workshops beginning in April 11th from 6:00 to 8:00 PM. The Kimchi featured for this work shop is Baechu kimchi (traditional winter kimchi). APCC is pleased to have H-Mart Lakewood as the major supplier/sponsor for the Kimchi workshop series. APCC & Lakewood YMCA Partnering to Bring to This Friday's Late Teen Nite Crossing Cultural Boundaries. Free Classes and Demonstrations ! Asia Pacific Cultural Center and the Lakewood YMCA are partnering on an exciting event coming this Friday, February 28th at the Lakewood YMCA’s Teen Late Night. Please Share with your Community and Church Youth Groups and Organizations. art style done on rice paper in Chinese Ink and color with bamboo brushes. Washington State Asian Pacific Islander Coalition discussing priority legislative issues with the Governor and his key staff - relating to the Asian Pacific communities of Washington State. Local Northwest artist Bill Colby has a collection of his art work - Summi and woodblock prints on display at the APCC Gallery from January 4th to February 28th. He was a longtime art instructor at the University of Puget Sound and has had numerous solo exhibitions, shows and awards. His work is in 12 Art Museums-city collections, 13 Corporate collections, 6 University/college collections and 22 Public Schools in Washington state. The APCC Taste of Asia 2014 schedule is now available for your planning purposes. Please join us on the first Saturday afternoon of the month starting at 12:30 PM. Come and be prepared to observe, learn, cook and taste the food and culture of the Asia Pacific country featured for that month. APCC will host the 16th Annual Asian New Year Celebration on February 15, 2014 at the Tacoma Dome Exhibition Hall. The Island Nation of Tahiti (French Polynesia) will serve as this year's host nation. The public is invited to come and bring friends and family to this free family friendly event. SAVE THE DATE - FEB. 15, 2014 for Asia Pacific New Year Celebration at Tacoma Dome Exhibition Hall. If you are interested in your group performing at the event or want to set up a retail or food booth please call 253-383-3900 or email to faalua@comcast.net. Over 5,000 people attended last year's event. Mark your calendars for the new year, 2014 and be sure to include the first Saturday of the month for APCC's popular "Tea Experience" where tea traditions and culture from the various countries in the Asia Pacific region are shared. Check out the schedule to see which country is featured each month. Come, relax and enjoy with us a cup of tea at APCC. There is a small admittance fee of $5.00 for APCC members and $10.00 for non-members. Learn traditional Chinese in a fun and interactive way with emphasis on listening, speaking, reading, and writing! With an introduction to local culture, craft, and dances, students will learn Chinese language through dialogue and context. Now is your time to get away and take that cruise you've been thinking about for months or years. An opportunity to travel with friends to one of the most beautiful areas of the world...Hawaii. Not you typical tourist package. This tour will focus on culture...the heart of the people and country. Hawaii, the former Independent Kingdom and now 50th State of the United States has still managed to maintain much of its island sophistication, complexity and charm. Our newsletter is now available for viewing online. Please let us know if you have any questions or would like to be a contributor. Pungmul Nori! Samul Nori! Modum Buk!! Traditional Korean Drumming Class at APCC every Thursday evening at 5:30 PM, Call 253-383-3900 for more information. Click here for a listing of the award winning movies to be shown this year at APCC Movie Night on the third Thursday of the month. This is a free event showcasing an award winning movie from the Asia-Pacific Island region.